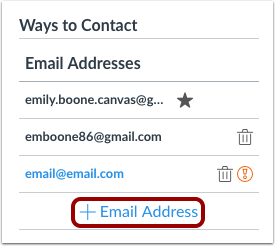 When you create a contact method in Canvas, you can use that contact method as a way to receive Canvas notifications. 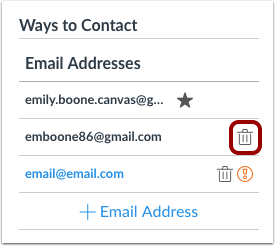 By default, notifications are sent to the email address used to create your Canvas account. However, you can add an additional email address if you do not want to use your existing email address or want to use an additional email for notifications. Learn how to set notification preferences. In the Email Addresses section, click the Add Email Address link. Type in the email address you want to add in the text field . When you are finished, click Register Email . Open your email account you just added. Click the link that is in the email to finish registering the additional email address. You may have to check your junk mail folder. 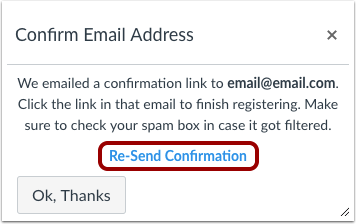 If you need to resend the confirmation, click the Re-Send Confirmation link. To delete the email address, click the Delete icon. Previous Topic:How do I set my Canvas notification preferences as a student? Next Topic:How do I change my default email address in my user account as a student? 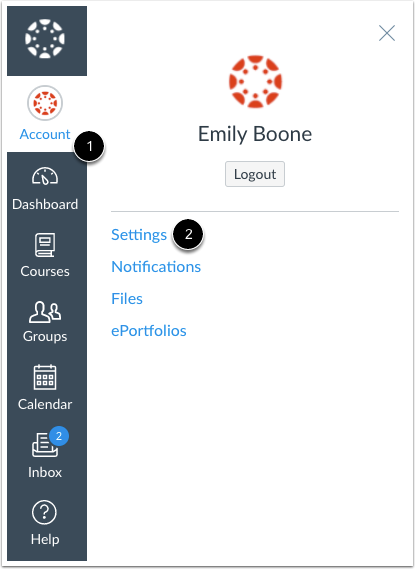 Table of Contents > Profile and User Settings > How do I add an additional email address as a contact method in Canvas as a student?